Here’s a photo of the east end of Roosevelt Avenue in Flushing, where it meets Northern Boulevard at 155th Street and a shopping mall. For a number of reasons, I have always been fascinated with this particular junction. You can walk west from this point and travel down Roosevelt Avenue, which is in eastern Flushing lined on both sides with shade trees. It wasn’t too long ago that it was lined on both sides with eclectic Queen Anne buildings of various sizes, from cottages to mansions; these days, mostly multi-story apartment buildings can be found there. Roosevelt Avenue goes through the heart of Flushing at Main Street, where bustling crowds compete with auto traffic and a dozen bus lines for space. It’s the east end of the #7 Flushing Line and daily coughs up thousands of commuters, or accepts them, depending on the time. There is a Long Island Rail Road stop nearby as well. Continue west, and you will cross the rushing Flushing River on a viaduct that has a roadway beneath and an elevated train above. You will pass Citifield, home of the Amazing Mets since 2009. You will then burrow through the precincts of the International Express through Corona and Jackson Heights, where myriads of immigrants from South America, the Caribbean, Europe and east Asia commingle. 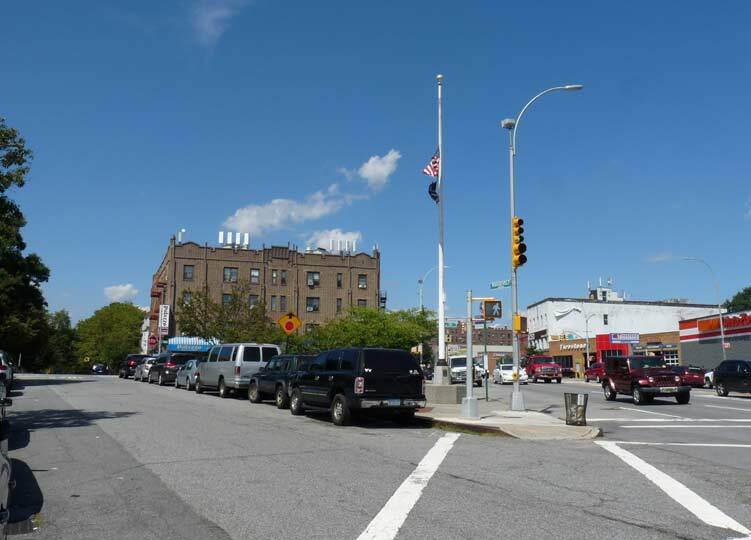 Once you make it to Woodside, Roosevelt Avenue becomes Greenpoint Avenue at Queens Boulevard. Plunging westward you will skirt the edge of one of the largest Catholic cemeteries in the world, Calvary. You will cross the noxious and noisome Newtown Creek, passing the landmark Digester Eggs, and plunge into the rapidly “gentrifying” Greenpoint, Brooklyn, which Mayor Bloomberg set on a path that would drive out its ethnic Polish and Latin middle class and replace them with high-rise honchos. And you will finally make it to the East River. What a fascinating walk it is. My fascination with this junction extends to area nomenclature. This 1926 map shows that this intersection, helpfully circled in red, did not exist at that time. In fact Roosevelt Avenue (note the pencil notation near the red circle) was only extended east here after 1928, when the #7 subway was built out to Roosevelt and Main. 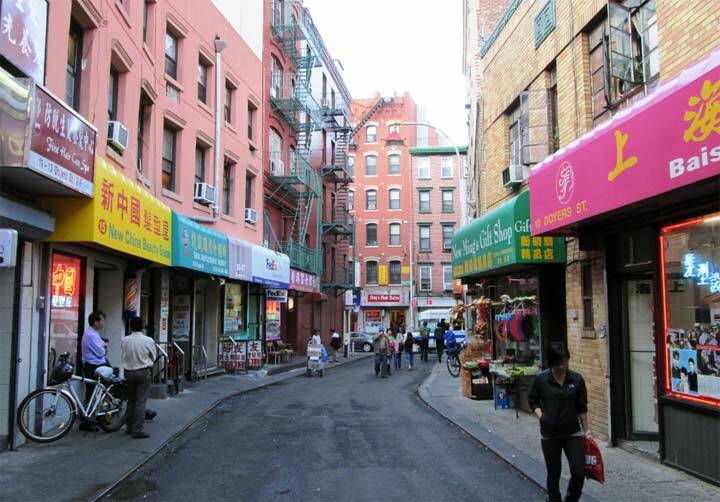 For generations, the road Roosevelt Avenue would become was known as Amity Street. When the new street numbering system came to Queens in the 1920s, it was called 40th Avenue for a while, then Roosevelt Avenue when the subway extension came; there were once plans to build that subway under Roosevelt Avenue and continue it down Northern Boulevard. 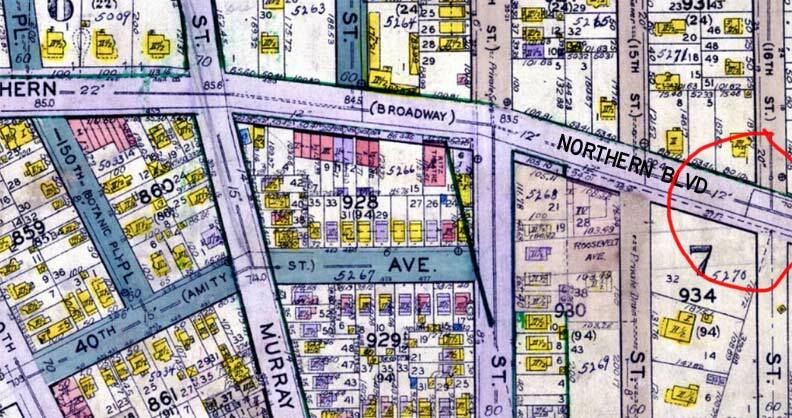 Northern Boulevard itself was called Broadway east of the Flushing River, until about 1920 when it was decided to place Jackson Avenue (west of the river) and Broadway (east of the river) under one name. The Northern Boulevard moniker continued to expand east into Nassau County, where it mostly overwhelmed the older name, North Hempstead Turnpike, east to the Suffolk County line. And that’s not all. Note that the north-south streets had the Town of Flushing’s old street numbering scheme; many Queens towns and villages had separate numbering schemes, until the borough’s Topographical Bureau adopted an overall numbering scheme for the borough, which is, of course, confusing in its own way. I am surprised that you haven’t mentioned the name of the triangle at Roosevelt Avenue’s eastern end: Leonard Square, and the McGoldrick Library facing this triangle, which is one of only four Queens Library branches named after a person, the others being Steinway, Poppenhusen, Langston Hughes. I’m not counting branches named after neighborhoods that are named after people.